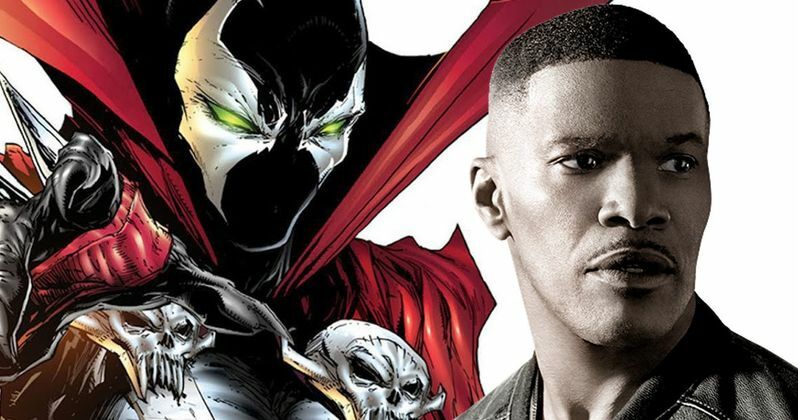 After a month of rumors, last week it was confirmed that the upcoming Spawn reboot will star Jamie Foxx as the title character, and now director Todd McFarlane has addressed the casting. Jamie Foxx released a statement last week where it was clear how passionate he was about this character, and now Todd McFarlane has offered some insight about what it's been like to work with him so far. Here's what McFarlane had to say in a new interview. "He's [Jamie Foxx] got a lot of thoughts on what he wants to do and how to do it. He's also very kind to go, 'At the end of the day, Todd, it's still your movie.' It's like I'm gonna be picking his brain as much as possible, and whoever else I get on the set. Not only just the actors, but also the editors and my cinematographer and everybody. Look, I'm gonna be arguably the most naïve, dumb guy on the set every day. So, as somebody who's been a CEO for decades now, the way to sort of make things work is just surround yourself with good people and give them ownership and give them input into the project. I mean, somebody, at the end of the day, has to make the final call. That's my position." Todd McFarlane created the Spawn comics, which debuted with Spawn #1 in May 1992, which became a huge hit. Five years later it spawned a movie adaptation, 1997's Spawn, starring Michael Jai White as the title character. There had been talk of a reboot for years, with the project ultimately landing at Blumhouse, with Todd McFarlane set to make his feature directorial debut, working from his own script. Here's what McFarlane had to say when asked about his approach to his own source material. "What I will be married to is what the scene or the emotion of the scene is supposed to convey. So, if I can keep that emotion, and you tell me that we have to shoot that outdoors or indoors, that's sorta secondary to me. I'm going, 'Cool, as long as I can get what I want. As long as I can get the emotion, I can get the beat, if you're saying that we can shoot this faster by doing it as an exterior shot, and we can do it in five hours instead of doing it inside for ten hours, I don't care.'" As of now, no other cast members have been announced, and it isn't clear when filming will begin. There was a report from March that claimed McFarlane was planning on starting production this May, but that didn't happen and there is no updated information about a production start date, or even a release date at this time. Still, now that Jamie Foxx has been cast, it's possible we could be hearing a lot more about this Spawn reboot. You can visit ComicBook.com for their interview with Spawn creator and director Todd McFarlane.